With high dimensional accuracy and surface finishes, Lanexis supplies custom-engineered products with Alumina (90% to 99.86%), Alumina Titanate, Yttria Partially stabilized Zirconia, Magnesia Partially stabilized Zirconia, Reaction Bonded / Silicon Infiltrated Silicon Carbide, Sintered Silicon Carbide materials. We offer a wide array of Industrial Ceramics Products. We offer Industrial ceramic parts to suit to the customers requirement and specifications. We offer a wide array of Industrial Ceramics parts. 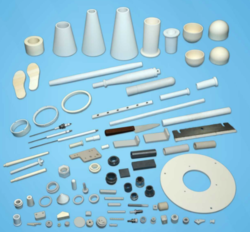 We offer Industrial ceramic parts to suit to the customers requirement and specifications. We manufacture Industrial Ceramics parts using 94% to 99.7% High Alumina and Zirconia material. Strong technical knowledge of ceramic structure, chemistry and our global presence help us to identify superior suppliers of ceramic raw materials and provide cost effective logistic management. In industrial ceramics products we manufacture porcelain products which are ideal for making of formers for latex processes. They do not get affected by heat or cold and do not soften or wrap in use. Being hard and strong, they can easily withstand all reasonable temperature variations. They are also hard and chemical resistant and do not easily degrade. To produce Intricate Internal Shapes in Investment Castings, Ceramic cores are used. With the help of Ceramic Cores critical castings having applications in Power Generation, Automobile, Transmission and other industries can be done in Investment Casting.